The Schwarzwälder Kirschtorte (Black Forest Cake) is perhaps the best known specialty from the Black Forest (Schwarzwald) region. This is a cake with multiple (usually 4) layers of chocolate sponge cake, cherries,and whipped cream. It is frosted with whipped cream and covered with chocolate shavings and a few cherries for decoration. Kirschwasser (cherry schnapps) is used to flavor the whipped cream. The bottom layers of sponge cake are also brushed with Kirschwasser (cherry schnaps) to provide moisture and a little extra flavor. The cake is made primarily of eggs, flour, cocoa, and sugar. The filling and toppings include whipped cream, Kirschwasser (cherry schnapps), chocolate, and cherries. The combination of cherries, cream, and Kirschwasser (cherry schnaps) seems to have been a popular dessert in the southern part of the Black Forest (Schwarzwald) long before the Black Forest Cake was invented. However, a specialty of Switzerland, the Schwarzwaldtorte, could have been the precursor to the Schwarzwälder Kirschtorte (Black Forest Cake). It was made with sponge cake, cherries, nuts, and whipped cream. Invention of the Schwarzwälder Kirschtorte is accredited to Josef Keller (1887-1981). Keller was a a pastry chef in the Cafe Ahrend (today "Cafe Agner") in the city of Bad Godesberg. Here he created the first Schwarzwälder Kirschtorte in 1915. By 1934, the Schwarzwälder Kirschtorte (Black Forest Cake) was known throughout Germany, especially in Berlin, as well as in Austria and Switzerland. In 1949, the cake was rated the 13th best known cake in Germany. Quickly thereafter, the cake grew in popularity to other countries. 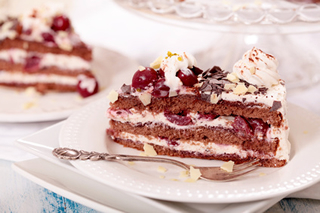 Today, the Schwarzwälder Kirschtorte (Black Forest Cake) is a favorite of Germans and known almost worldwide.